Abe and his friend Sol are out for a walk together in a part of town they haven’t been in before. Passing a Christian church, they notice a curious sign in front that says "$1,000 to anyone who will convert." "I wonder what that’s about," says Abe. "I think I’ll go in and have a look. I’ll be back in a minute; just wait for me." "Well," asks Sol, "what are they up to? Who are they trying to convert? Why do they care? Did you get the $1,000?" Indignantly Abe replies, "Money. That’s all you people care about." Ted Cohen thinks that’s not a bad joke. But he also doesn’t think it’s an easy joke. For a listener or reader to laugh at Abe’s conversion, a complicated set of conditions must be met. First, a listener has to recognize that Abe and Sol are Jewish names. Second, that listener has to be familiar with the widespread idea that Jews are more interested in money than anything else. And finally, the listener needs to know this information in advance of the joke, and without anyone telling him or her. Jokes, in short, are complicated transactions in which communities are forged, intimacy is offered, and otherwise offensive stereotypes and cliches lose their sting—at least sometimes. Jokes is a book of jokes and a book about them. Cohen loves a good laugh, but as a philosopher, he is also interested in how jokes work, why they work, and when they don’t. The delight at the end of a joke is the result of a complex set of conditions and processes, and Cohen takes us through these conditions in a philosophical exploration of humor. He considers questions of audience, selection of joke topics, the ethnic character of jokes, and their morality, all with plenty of examples that will make you either chuckle or wince. 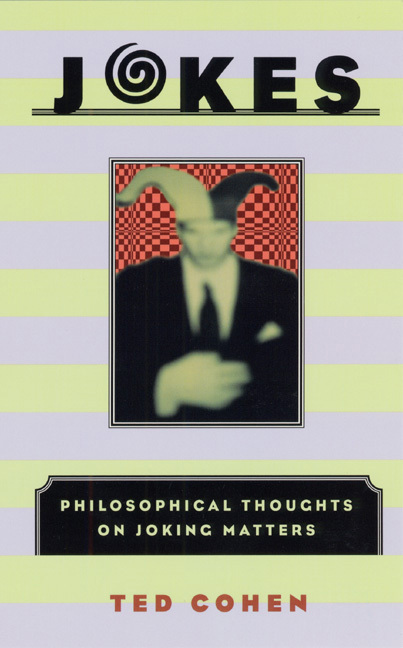 Jokes: more humorous than other philosophy books, more philosophical than other humor books.